Cryotherapy: Therapeutic but is it clinically relevant? Try thinking of a title about Ice and avoid the temptation to put “Baby” in it! The thing that I love about physiotherapy is that nothing is ever black & white. Things will come in and out of fashion and our understanding about interventions and treatment modalities will continuously evolve. One of the great debates is about the use of ice following injury. How long should we apply it? In what form should we apply it? Should we use it all? I recently skimmed through the Physical Therapy in Sport journal under “Articles In Press” and saw two papers within that category alone that discussed the use of cryotherapy. (For anyone that is a geek like me and hasn’t got the Health Advance App by Elsevier, get it! ACPSEM members can access all the content for free here http://bit.ly/PTISaccess). The first paper was a systematic review (Martimbianco et al 2014), which instantly lost my attention, from my point of view they combine the conclusions of a multitude of papers and varying methodologies (all with their own unique methodological flaws) to create a super-conclusion that most of the time isn’t clinically relevant or is very noncommittal. Essentially, systematic reviews are literature stereotyping. In this case, said paper based a lot of its findings on papers from in the early 1990’s. It concluded that there was not enough evidence to draw a definitive conclusion on the use of cryotherapy following ACL reconstruction. The second paper however, provoked a bit more thought. This study was by Phil Glasgow, Roisin Ferris and Chris Bleakley – with Glasgow and Bleakley from the recent POLICE guidelines fame – who better to critique the use of ice? What do we think we know about cryotherapy? The first thing to distinguish is the method of cryotherapy; in what form should ice / cold be applied? Cryotherapy comes in forms of crushed ice to blocks of ice, buckets of cold water to cold water baths, compression devices to good old-fashioned ice spray on the side of the pitch. In any form, the proposed clinical benefits encourage a pumping effect on vascular system to encourage blood flow, nutrient and waste transportation (Wilcock, Cronin & Hing 2006). Then there are psychological benefits of feeling more “awake” and less fatigued (Wilcock et al 2006). A recent Cochran review (Bleakely et al 2012) found that CWI is superior to passive intervention at reducing muscle soreness. (I know, I slate systematic reviews then use them to my advantage). The point I’m getting at is that of all the proposed benefits of cryotherapy, the most weight is behind the subjective benefits. 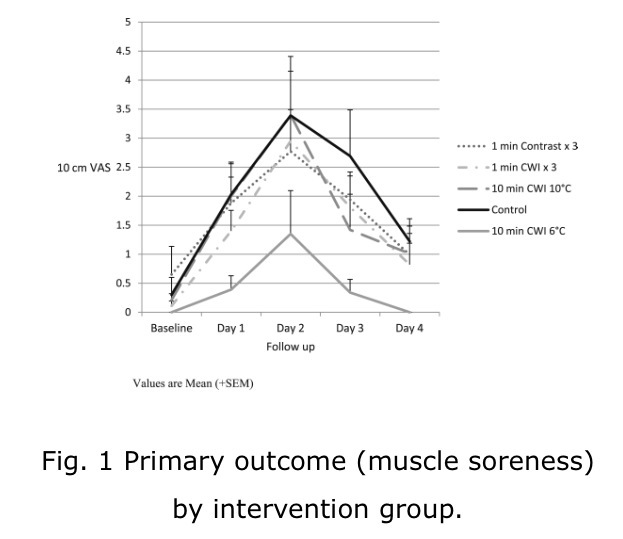 Take Glasgows recent paper; The control groups scores of VAS pain following eccentric hamstring exercises were 20% higher than one of the intervention groups that underwent 10 minutes immersion at 6ºC (see image below source). The results were not statistically significant but they do look clinically relevant. These percentage differences do not have to be statistically significant for them to have a major benefit in elite sport, where marginal gains has now become a specialised role in itself thanks to Dave Brailsford and the British Cycling team. Everyone is looking for that extra percent to enhance performance & results. Where does ice fit in the treatment room? It has been found that tissue temperatures below the subcutaneous layers are very difficult to influence due to the highly sophisticated homeostatic systems in place. Bleakley, Glasgow & Webb (2012) found the changes in tissue temperature are not enough to influence metabolic activity. However we do know that CWI will reduce skin temperature, even if it doesn’t affect tissues below (Algafly & George 2007). We also know how important the skin is in feeding information back to the CNS. It plays a huge role in proprioception and nociception. In our treatment room, we still advocate the use of ice despite the emergence of this new understanding. What has changed in recent years is our thought process behind what is happening as a result of the ice. Instead of using cryotherapy in isolation to limit swelling, we now combine it with compression (which is proven to assist with swelling and decreasing CK levels etc) to reduce pain. 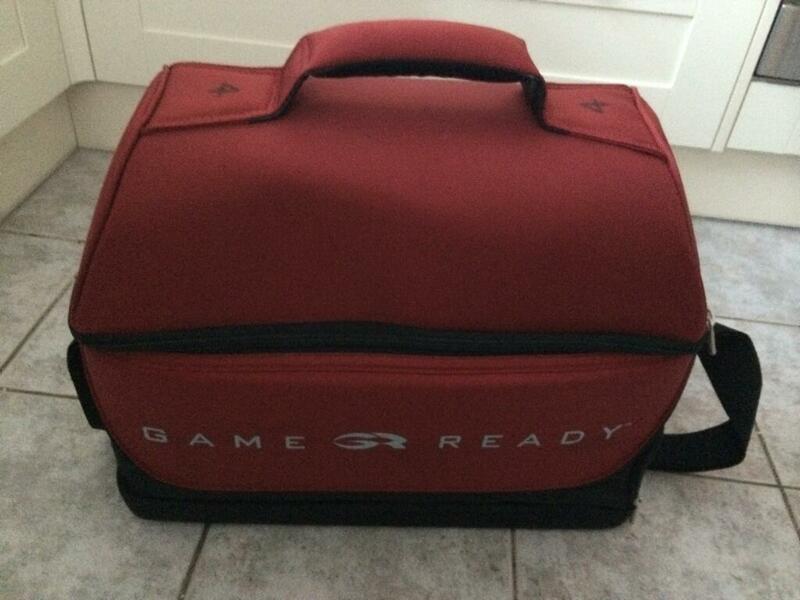 For more proximal soft tissues injuries, we have the luxury of a Game Ready machine to compress and cool affected areas. However for more distal injuries, e.g. Following an ankle sprain, we will encourage the player to submerge their foot in a bucket of 1/3 ice and 2/3 water. As soon as the foot goes numb, we begin some appropriate movements (cryokinetics) depending on injury location, structures involved etc. By doing this, we believe the hydrostatic pressure of the water will act as local compression while the ice provides appropriate analgesia. The analgesia then allows us to begin some loading of damaged structures – thinking back to the POLICE guidelines that advocate Optimal Load. Every stage of this treatment is clinically reasoned. The movements undertaken should not exceed normal ranges of movement and must be pain-free. At the moment, cold water immersion is commonly used as a recovery modality from exercise, especially exercises that elicit DOMS, but with very little empirical evidence to support this. Despite this, we have subjective improvements in pain following any ice interventions. If we can accept that and build that into our clinical reasoning, then we have a way of removing pain from our limiting factors and enabling us to introduce movement to an injured structure. So, although we can’t clinically justify the use of cryotherapy as a recovery modality, I would advocate it as part of a treatment & rehabilitation program.